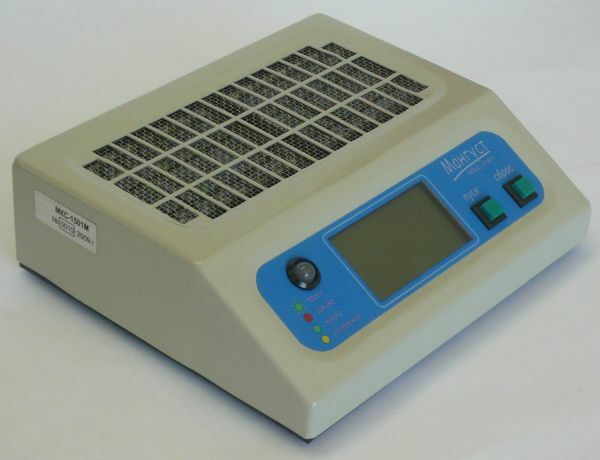 MKS-1501M Instrument is applied in banks in the course of cash money reception and distribution for detection of banknotes with radioactive contamination. As regards its parameters and functional capabilities the Instrument fully complies with requirements of Instruction No.131-И dated 4th December 2007 issued by Central Bank of Russia For Procedure of Radioactively Contaminated Banknotes Detection, Temporary Storage, Cancellation and Destruction in order to monitor certain banknotes, check stubs, packs and coins radioactive contamination. MKS-1501M can be applied both autonomously and as a part of stationary (desk mounted) radiation monitoring systems. .
- Measuring of gamma-radiation equivalent dose rate and beta-particle flux density, this flux being emitted from the examined object surface. - Measuring of gamma- and beta-background at the working place is performed automatically when the Instrument is switched on. After 40 seconds value of gamma- (mcSv/ hour) and beta- (part./ min. *cm2) background will be indicated on the Instrument display. If the result shows CLEAN, operation can be continued and the next object can be examined. If the result shows CONTAMINATION, it is necessary to switch on the mode of the object contamination measuring as regards gamma-radiation and beta-particle flux density. The mode is switched on manually after completion of contamination detection without the object removal from the Instrument measuring surface. Measuring results such as excess of equivalent dose rate in mcSv/ hour and flux density in part. / min. *cm2 over the background will be shown on display (measuring time is not above 40 seconds).